The Rambla, often plural "Las Ramblas", is one of the landmarks of Barcelona, which makes this metropolis so unique. The approximately 1.3 km long road - in the middle a pedestrian zone - is ranging from Plaça Catalunya, probably the central transport hub in Barcelona to the port. The finish is the highly visible monument of Columbus. Thereafter, the Rambla del Mar is an extension of the historic Ramblas to the Maremagnum, a shopping centre in the harbour. The Rambla is divided into several sections, each with their own character. The Ramblas, devide the old town in the Barri Gòtic and Barri Raval. The Ramblas, you can also know with our tour with proposal "Around the Rambla". The top part of the Rambla begins at the Plaça Catalunya. He was named after the Font (Source) de Canaletes. As the saying claims that those who drink from the fountain, always reverts back to Barcelona. Probably, it is more of the charm of the Rambla, as the chlorinated water, in its spell. At the beginning of the Rambla can give both sides chairs, to invite a short rest (for the seats there is a small fee). The following section of the Rambla is named after the former University. This university was demolished in 1843. More true for this part of the Rambla is certainly also the common name Rambla del Ocells ( "bird-Rambla"). Numerous vendors sell their birds - and other small animals like guinea pigs, turtles and young dogs. At the end of this section is at right on the corner of Carrer Carme the gothic-baroque Jesuit church Església di Betlem, on the other side of the Palau Moja, a men's Palace of the 18th Century. There are occasional exhibitions to visit. Towards the sea are now the bird dealer replaced by florists. In the 19th Century there was the only place where flowers sold in Barcelona. To your right hand if you look in the direction of the port, is the Mercat de la Boquerìa, Barcelona's biggest market. This includes about 800 booths. A visit is worth purchasing even without intention. 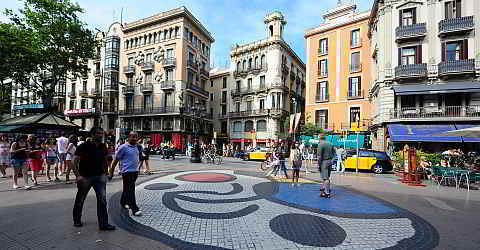 On completion of the Rambla de les Flors is the Pla de la Boqueria, a small square, whose patch has been drafted by Juan Miró. This part of the Rambla is the Rambla of street actors, living statues and cafes. This is where the artists for their more or less spectacular pieces of art submitted. In their wake are unfortunately also the pickpockets. Please refer to a few safety precautions and you will have no problems with dealing with them. On the right is from outside very inconspicuous, but very beautifully from the inside, the Opera de Gran Teatro Liceu. On 31 January 1994, it was completely destroyed in a fire, but has been rebuilt. Here is the next to Bayreuth the largest Wagner festival. At the last section of the historic Rambla, immediately before the port, you will find souvenir stands and art dealers, and the painters who portray a caricature. Previously, it was clear from the nature of the nearby red light district in the Barrio Chino in the district Raval. This character in the lower part of the Rambla fortunately lost. On the right is in a former convent of the 17th Century the Museum Centre d'Art de Mónica. It shows changing exhibitions of contemporary art. Across lies in a tiny side street the waxworks-museum. The 1994 built Rambla de Mar is not a historical part of the Rambla. Crosses from the Rambla de Santa Mònica take the Passeig de Colombia, you get to the shore. From this you get from an imposing, wavy wooden bridge on the Moll d'Espanya in the centre of the port basin. There is the Maremagnum complex with shops, cafes, restaurants and cinemas and the Maritime Museum. The iron statue of Columbus is a great way to get an overview of the Rambla and the port. Beautiful view! The Rambla in Barcelona was originally a river bed ( "rambla" = Arab "sandy Boder") and marked up the 14th Century the western city limits. In the following time settled a number of monasteries. In 1775 the city walls diverged from the medieval shipyard Drassanes. Towards the end of the 18th Century then a kind of promenade was established. The Ramblas were always on the scene and political upheaval. The Rambla is today, both for locals as well as for tourists, certainly the most popular promenade. Of the five sections of the road, everyone has his own character and its own story. The Rambla is wonderful for a stroll. But be a little careful: at the cone players you can only lose and you make it pickpockets easy. Also take a look right and left of the Rambla into the neighborhoods, you can discover a lot.